A bit of advice: if you’re going to see The Play That Goes Wrong make sure you visit the facilities first. Otherwise you’re going to have a hard time not peeing in your pants at the show’s avalanche of ridiculous mishaps descending on a troupe of amateur British actors. 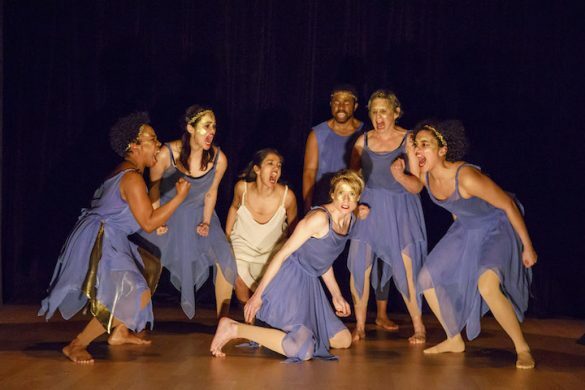 The nearly continuous laughter filling the Lyceum Theatre when I went indicates that what began in a tiny fringe venue before moving to the West End (where it’s now in its third year) is two hours of lowbrow manna from comic heaven. This is a show you can laugh, chuckle, giggle, chortle, snicker, guffaw, hoot, titter, and roar at as a farcical illustration of Murphy’s Law, i.e., if it can go wrong it will go wrong. Thanks to the zany brilliance (or brilliant zaniness) of Henry Lewis, Jonathan Sayer, and Henry Shields, who not only wrote the play for London’s Mischief Theatre (which began as an improv group emerging from LAMDA) but are also in it, the nonstop nuttiness stems from a production of the fictional Cornley University Drama Society’s production of The Murder at Haversham Manor, a 1920s-style murder mystery in the Agatha Christie mode. 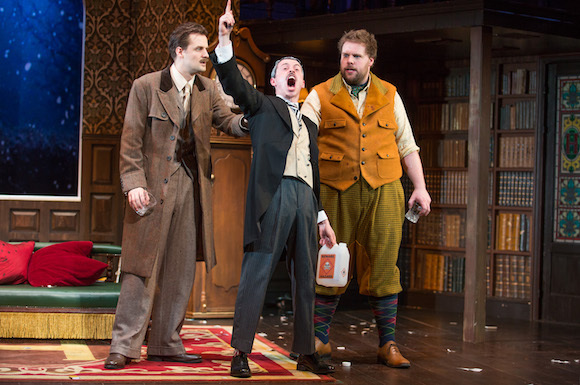 The play-within-the-play is amusingly introduced by its director, Chris Bean (Henry Shields), who also plays the John Cleese-like Inspector Carter, called in to solve the murder of the wealthy Charles Haversham (Greg Tannahill), found dead in his dressing gown on the drawing room divan. The broad-where-a-farce-should-be-broad action swarms with stereotypes, like Charles’s stiff-upper-lipped friend, Thomas Colleymore (Henry Lewis), dressed in tweedy knickers; the butler, Perkins (Jonathan Sayer), his silver hair painted on, his lines printed on his hands; Florence Colleymore (Charlie Russell), Thomas’s femme-fatale sister and Charles’s fiancée; Cecil Haversham (Dave Hearn), Charles’s white flannelled, anyone-for-tennis? brother and Florence’s lover; and Arthur (also Hearn), the doofus gardener, carrying a chain attached to an absent dog named Winston (the real one’s gone missing). Each actor, by the way, is credited with the name of the one they play (thus Jonathan Sayer plays Dennis Tyde who plays Perkins) and gets a faux program bio to boot. But even before director Bean arrives, nothing’s been going right, as worried cast members have been wandering the aisles searching for a lost Duran Duran CD and that missing dog. The scenery’s so iffy that an audience member is recruited to help fix it. Then, as The Murder at Haversham Manor unfolds, disasters follow in legions: wall props fall off, lines are forgotten, props catch fire, actors get knocked out, scenery falls apart, words are mispronounced, sound cues get bolloxed up, spotlights are misdirected, and on and on. Under Mark Bell’s inspired, precisely timed, slapstick staging, everything works to make it seem like nothing’s working, including a truly remarkable set by Nigel Hook—perfectly lit by Ric Mountjoy—that deserves a special award for ingenuity and acting prowess. I actually whooped at its often spectacular antics. Of course, a good reason all the physical havoc works is the sangfroid with which the show’s gifted mummers play their idiotic characters, reveling in straight-faced aplomb as they doggedly advance in perpetual combat with walls, windows, floor boards, pillars, doors, heads, and props. The deliciously overacting, plummy-voiced ensemble—vivaciously well-costumed by Roberto Surace—is so faultlessly cast it’s difficult to single anyone out. I got a kick out of Dave Hearn’s mindless goofball who uses every moment to bask in the audience’s reactions. Also bathing in self-glorification is the Florence of Charlie Russell, whose “fits” exemplify good bad acting. 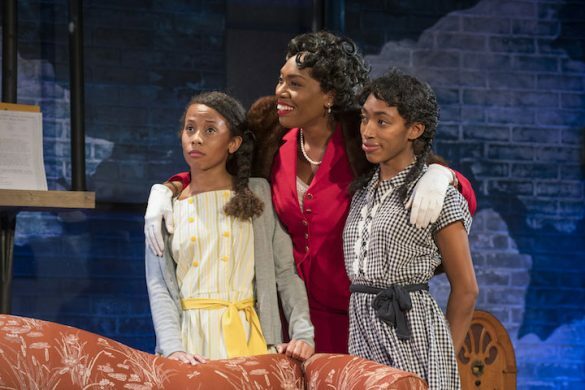 Henry Lewis has a show-stopping bit of acrobatic acting on a scenic precipice, and there’s also Nancy Zamit’s doofus Annie, the stage manager who takes over for Florence when she’s flattened by a door, and eventually overcomes her jitters to battle Florence when she wants to resume her role. 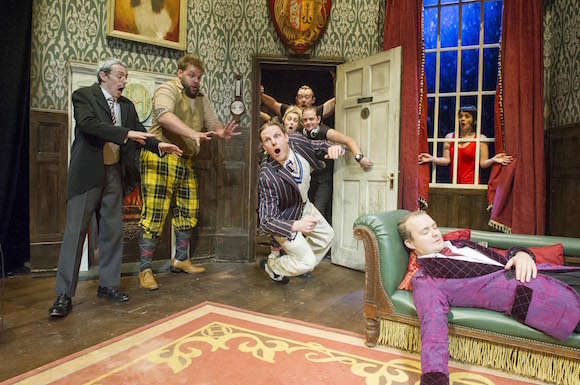 Of course, The Play That Goes Wrong follows a path already blazed by plays about theatrical mayhem like The Torch Bearers and Noises Off, but it does so with such panache that it should be subtitled Or the Play That Goes Right.